In 2015 as IDPA began adding divisions, I committed to the goal of shooting CCP Master and eventually becoming a 6-Gun Master — a challenging goal for someone who had never shot better than Sharpshooter on the 90-round IDPA Classifier. I was shooting local IDPA matches and often dropping only a handful of points. However, my times were not good and I never finished the match much higher than middle of the pack. I resolved to get better and began shooting the IDPA Classifier on a regular basis. I quickly discovered that no matter how often I shot the classifier, I was a solid Sharpshooter. I asked IDPA Distinguished Master Gregg Kratochvil if there was a secret to shooting fast and accurately. "If you want to learn to shoot fast — you have to shoot fast," Gregg said with a slightly surprised look on his face. Wow, perhaps I'm a little dense, but that was a revelation. Shooting fast while hitting the target necessarily requires a balance between speed and accuracy. Hitting this balance depends on the target, distance, situation and your skill. I had often heard the phrase "slow is smooth and smooth is fast." That never made sense to me and I noticed the typical person uttering the phrase was almost always shooting slowly. I began to suspect the shooters saying this really did not understanding the underlying principles. I realized that if I only practiced slow, deliberate marksmanship, then that was the only skill I was developing — slow, deliberate marksmanship. It became obvious that speed was not going to just happen on its own. I persevered and continued to try and shoot Master times while simultaneously developing an efficient reload and working on trigger control and sight alignment/sight picture. Clearly, if you want to learn to shoot fast, you need to spend time working on speed. Shooting is just like any other activity; the only way you'll make significant gains is by pushing the envelope. I began to understand what the pistol felt like when I was shooting fast. Sub-80-second overall times became the norm, and (interestingly) I started dropping fewer points as well. Controlling the pistol at speed was becoming easier and my accuracy was improving. I was paying attention to what the pistol and target were telling me. I also developed a healthy respect for the gentlemen who conceived of the 90-round IDPA classifier; it truly does measure your shooting skill. As I continued practicing, my typical CCP classifier scores improved from Sharpshooter to Expert. I started finishing near the top in our local matches and even began winning a few. An unanticipated but welcome side effect was that the skills I was developing with my CCP pistol (a Springfield XD) transferred to other pistol platforms without too much difficulty. One day, a friend loaned me his SSP pistol, and I shot SSP Expert and then with a different pistol shot Back Up Gun (BUG) Master. Learning to shoot fast is harder than simply learning to shoot accurately because you are learning to go faster than you ever have before. 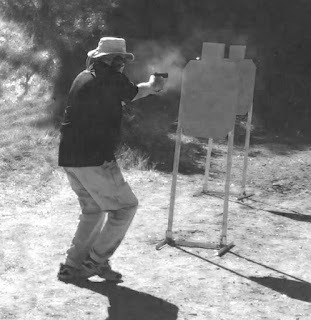 You must teach yourself faster trigger manipulation, to align the sights faster, and control recoil better. As the classifier demonstrates, accuracy and speed exist in balance. Push one to the limits of your skill and you'll necessarily see the other suffer. I learned that if you shoot fast, you will miss sometimes, but that is OK because accuracy does catch up with continued practice. However, speeding up does not mean purposely missing the target, nor does it mean spraying bullets as fast as you can. Learning to shoot faster means pushing yourself and getting a little (but safely) out of control as you find the limit of your skills — and then pushing beyond them just a little. Try to make every shot count and every trigger pull perfect — they won't be, but you must try. Be careful of inadvertently introducing bad habits as you speed up. This is particularly true of trigger manipulation. I discovered that as I sped up I was developing bad trigger habits. The target will tell you when bad habits begin to creep in, especially for longer distance targets. If you have a video camera, take it to the range and record what you are doing. As you speed up, it becomes more challenging to determine exactly what is happening as you shoot. Video will show you things (good and bad) you may not realize you are doing. You will hit plateaus as you progress. When I started practicing in earnest, I generally shot the classifier in the mid-120s. As my speed and accuracy improved and I pushed past the plateaus, I generally dropped about 10 seconds before I would hit another. These drops reflected my skill at that point in the process. It is frustrating sometimes, and there is a tendency to focus on the negative. Don't let negative thoughts intrude — focus on what you are doing right and correct the areas that are causing you problems. Always finish every practice session on a positive note with something you do well whether it is shooting a close-range speed drill, deliberate shots, etc.